Due to the specific physical and chemical properties of certain groundwaters, the article number 5 of the Act of 9 June 2011 Geological and Mining Law (Official Journal 2017, item 2126, uniform text) classifies brines, curative or thermal waters, as opposed to fresh groundwaters, as minerals. Before the Act of 9 June 2011 Geological and Mining Law was implemented, the number of brines, curative and thermal waters was specified in the Ordinance of 14 February 2006 of the Council of Ministers about groundwater deposits classified as brines, curative and thermal waters and others curative minerals and also about classifying some deposits of common minerals to basic minerals (Official Journal No. 32, item 220, with subsequent amendments). Now after outlawing this ordinance only those brines, curative and thermal waters are minerals which meet the requirements of Geological and Mining Law, wherein according to the Act (article 203 paragraph 1) brines, curative and thermal waters considered as minerals in the light of the previous regulations keep their status. Brine: groundwater with total solid dissolved minerals at least 35 g/dm3. According to the Ordinance of the Council of Ministers only the deposit in Łapczyca in Małopolskie voivodeship is classified as brine. This brine, occurring in Miocene sandstone formation, is used for therapeutic and bath salt production. 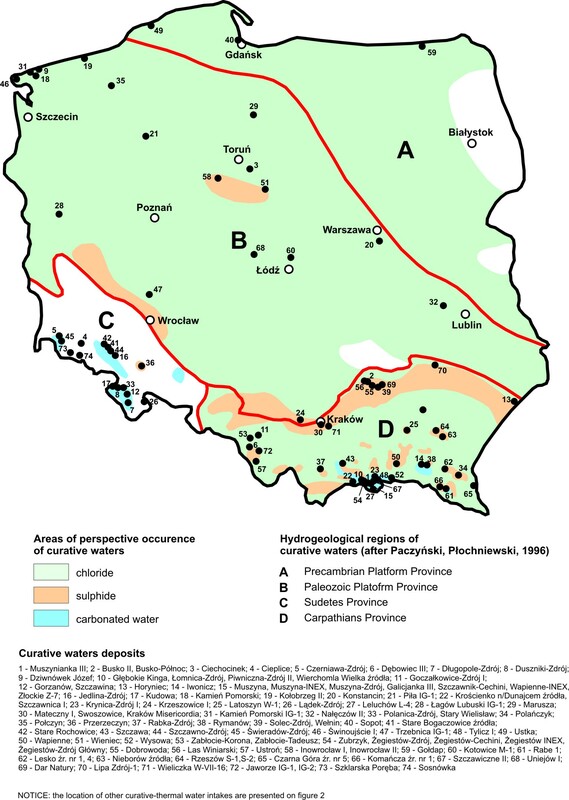 Groundwater with similar composition (strongly mineralized waters of Cl-Na or Cl-Na-Ca type) are common in the area of Polish Lowlands. They occur in very deep formations, at depth of some thousand meters. carbon dioxide content – at least 250 mg/dm3 (250-1,000 mg/dm3 carbonic acid waters, ≥1,000 mg/dm3 carbonated water). Most of curative waters occur in towns of southern Poland, in Sudetes and Carpathian region (together with Carpathian Depression). Over 70% of health resorts and towns with curative waters are located in this area. The rest of deposits occur in Western Pomerania and in Polish Lowlands. Curative waters are used mainly for balneotherpy in 42 health resorts and other towns (Dobrowoda, Las Winiarski, Marusza, Krzeszowice, Szczawa, Wełnin) and bottling purposes (i.e. Krynica-Zdrój, Muszyna, Piwniczna-Zdrój, Andrzejówka, Jastrzębik, Milik, Powroźnik, Wojkowa, Złockie, Zubrzyk, Szczawa, Szczawnik, Tylicz, Wysowa, Polanica-Zdrój, Busko-Zdrój, Ciechocinek, Inowrocław, Kołobrzeg, Rymanów-Zdrój, Kraków-Swoszowice, Szczawnica, Szczawno-Zdrój, Gorzanów) but also for salt, lye and mud production and pharmaceutic preparations (i.e. Busko-Zdrój, Ciechocinek, Iwonicz-Zdrój, Rabka-Zdrój, Goczałkowice-Zdrój, Kołobrzeg, Lądek-Zdrój, Połczyn-Zdrój, Rymanów-Zdrój, Dębowiec, Zabłocie). In Krynica-Zdroj and Duszniki-Zdroj natural carbon dioxide is obtained from curative waters. specific waters waters of various mineralization (Fe, F, J, S, H2SiO3, Rn, CO2, thermal). Thermal water: groundwater having the temperature of 20oC at the outflow. Taking the purpose of exploitation into consideration, the waters for heating and recreation purposes are considered as thermal waters. 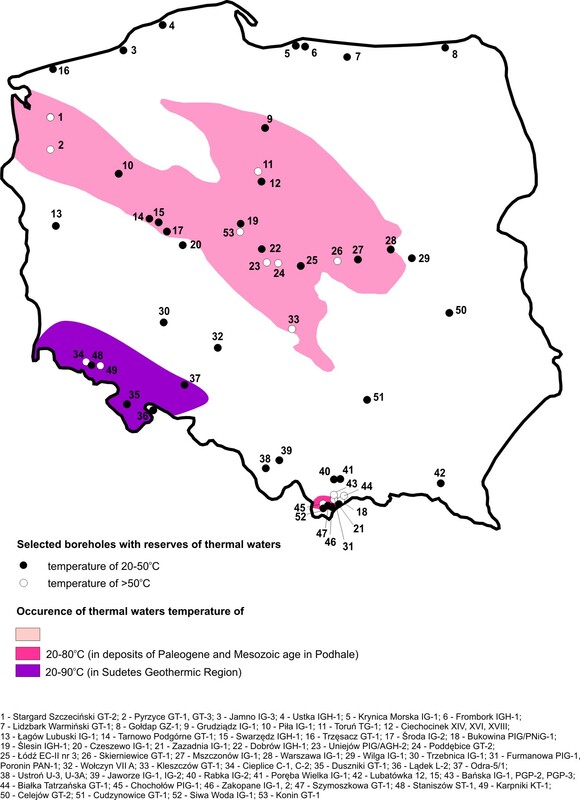 Thermal waters in Poland occur in the area of Polish Lowlands within the large reservoirs of regional importance, also in Carpathians and Sudetes where the deposits are mainly small basins (Podhale) or are limited to tectonic zones. (fig. 2). In the area of Polish Lowlands, thermal waters from Lower Cretaceous and Lower Jurassic formations are the most perspective for use. They occur in widespread hydrogeological basins. In Carpathians thermal waters occur especially in Cretaceous, Paleogene and Neogene formations and also in Devonian and Triassic deposits of Podhale Trough, which is characterized by small area and strong tectonic influence. In the Carpathians Forehead, thermal waters occur in Cambrian, Devonian, Carboniferous, Jurassic, Cretaceous and Miocene formations. In Sudetes the most perspective formation is Carboniferous aquifer in the vicinity of Jelenia Góra. Strong tectonically involved Carboniferous magmatic and metamorphic rocks are her thermal water collector. Thermal waters are also in Lądek-Zdrój, Duszniki-Zdrój and Grabin in the vicinity of Niemodlin. Thermal waters are used for heating (Podhale, Mszczonów, Uniejów, Pyrzyce, Stargard, Poddębice), relaxation (i.e. 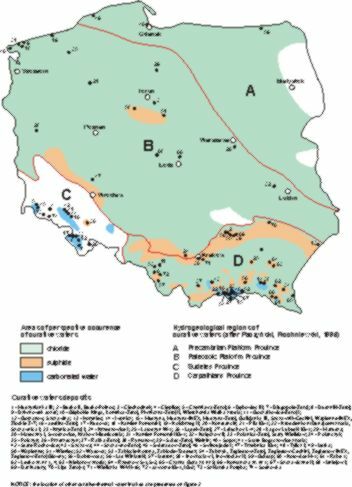 Zakopane, Szaflary, Bukowina Tatrzańska, Białka Tatrzańska, Uniejów, Mszczonów, Poznań, Cieplice Śląskie-Zdrój) and balneologic purposes (Uniejów). Waters from mine dewatering are not considered as brines or thermal waters. The presented balance for the year 2017 includes the data about disposable resources and reserves, the amount of brines, curative and thermal waters output. The balance sheet comprises these deposits which are registered in MIDAS and Bank Wód Podziemnych Zaliczonych do kopalin MINERALNE databases. The balance was worked out on the basis of users’ reports collected by the Polish Geological Institute-National Research Institute in Warsaw. The data was divided not only according to Paczyński and Płochniewski hydrogegological units division (1996; Table 1) but also according to Polish districts division (Table 2). "Annex no. 2 to hydrogeological documentation for exploitation discharge determination of Wełnin curative waters", prepared due the implementation of an additional Wełnin exploitation well no 4 within the Wełnin deposit. "Hydrogeological documentation for liquidation of P-11A intake in Muszyna", showing the results of execution and liquidation of curative water intake (negative borehole). "Hydrogeological documentation for exploitation discharge determination of curative waters from Paleogene deposits by P-17 intake in Powroźnik", prepared due to exploitation discharge determination for a new intake within the Muszynianka III deposit. "Annex no. 3 to hydrogeological documentation for exploitation discharge determination of Dobrowoda G-1 curative waters intake in Dobrowoda", prepared due the implementation of an additional exploitation well execution and due to new results of geological survey obtained during documentation the area of Busko-Zdrój and Solec-Zdrój. "Annex no. 2 to geological documentation for exploitation discharge determination of Tadeusz and Korona in Zabłocie wells", prepared due the actualization of exploitation discharge of both intakes. "Hydrogeological documentation for liquidation of P-4 intake in Piwniczna-Zdrój", showing the results of liquidation of curative water intake. The cause of liquidation was small exploitation discharge, no water request and no exploitation since 1997. "Annex no. 1 to hydrogeological documentation for exploitation discharge determination of Cretaceous curative waters in Świnoujście", prepared due the reconstruction of 4a intake (The 30th century). "Hydrogeological documentation for liquidation of Misericordia curative waters intake in Cracow", prepared due to exploitation discharge determination within the new deposit. "Annex to hydrogeological documentation of mineral groundwater intake from upper Cretaceous deposits, J-150 intake", prepared due to emergency intake preparation. "Hydrogeological documentation for exploitation discharge determination of curative water from Paleogene deposits from the following boreholes: G-9 in Jastrzębik and G-14 in Powrośnik", prepared due to exploitation discharge determination for a new intakes within Galicjalnka deposit III - Field 1 and 2. "ydrogeological documentation for exploitation discharge determination of curative water from K-2 intake in Powroźnik, Muszyna district for ZPHU INEX Ltd", prepared due to deepening the freshwater intake and exploitation discharge determination for curative waters. “Hydrogeological documentation for exploitation discharge determination of curative waters from IN-4 intake in Muszyna for ZPHU INEX Ltd.”, prepared due to exploitation discharge determination for a new intake within existing deposit. In the analyzed period no documentation considering brines and thermal waters was approved. "Hydrogeological documentation for disposable resources determination of curative waters in Wilga catchment area - Mateczny region". The amount of brines, curative and thermal waters intake in 2017 was calculated on 12 916 225.27 m3/year. In comparison to the previous year it has increased of about 428 426.27 m3. Notice: in case of springs and artesian flows, only amount of used waters is given, not total amount of outflowing water.